Home / Blog / Foodservice Check Up: the 2017 Healthcare Foodservice Industry of the U.S.
Foodservice Check Up: the 2017 Healthcare Foodservice Industry of the U.S. In 2017 the healthcare industry in the United States is facing a number of changes. As the healthcare debate continues in Washington, it creates an ever-evolving environment that some foodservice companies may be able to mine for new accounts. For those organizations interested in capitalizing on white space opportunities created by this landscape in flux, CHD Expert recently evaluated data and trends within the healthcare market. As of August 2017, there are more than 60,500 healthcare facilities in the United States, according to CHD Expert’s foodservice database. This includes hospitals, rehabilitation centers, clinics, nursing homes, assisted or senior living centers, and other healthcare establishments. Of these facilities, the majority (approximately 61%) are managed by foodservice management companies. The “big three” of these companies are Aramark, Sodexo, and Compass. Meanwhile, around 39% of healthcare facilities have self-operated foodservice operations. CHD Expert estimates that approximately 42% of all healthcare providers in the United States have between 101 to 500 beds. The numbers are similar when looking at just the hospital landscape, with 36% of hospitals having between 101 to 500 beds. Also in the hospital landscape, 41% have between 1 to 50 beds and 19% have from 51 to 100 beds. When looking at meals served per day, 41% of healthcare facilities in the U.S. serve between 51 to 100 meals per day. Just 2% of healthcare facilities serve from 1,001 to 2,000 meals per day and the majority of these facilities are located in high population areas such as New York City, Los Angeles, Philadelphia, Miami, and Houston. This location data fits in with the larger geographical picture of healthcare facilities, as most facilities are located primarily within major cities, larger metropolitan areas, and within population-dense states. For example, the top five states with the most healthcare facilities overall are California, Texas, Ohio, Florida, and New York. Are you interested in learning more about healthcare foodservice data? 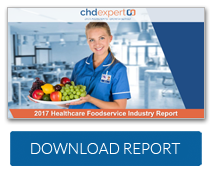 Click here to download the 2017 Healthcare Foodservice Industry Report that details foodservice in the nation’s healthcare facilities. CHD Expert is an industry leader in collecting, managing, and analyzing foodservice data. We have all kinds of foodservice data available, including healthcare foodservice data, and our database features 40+ filters you can use to segment data. If you’d like to speak with one of our representatives, please email [email protected] Or, feel free to give us a call.